Tuxedo The cat. He adopted us and was named Tuxedo because of the Tux he wears. 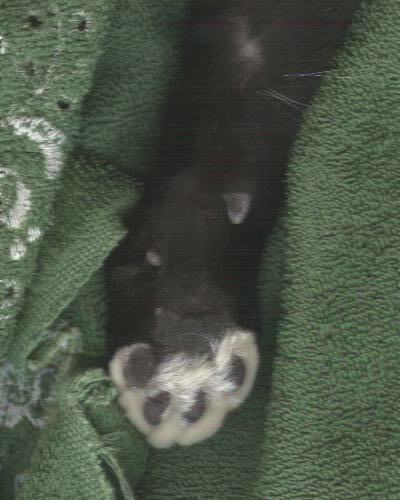 He even has tuxedo cuffs on his paws. 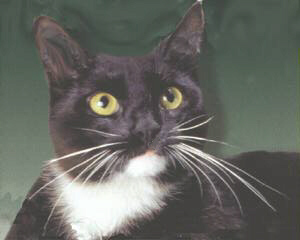 Tuxedo is an American Short Hair Cat. Tuxedo The Cat came to our remote California canyon and decided to stay. At first he would hang around, but not let anyone get close to him. As time passed he would get closer, and finally let us touch him. Then he would get in our lap and finally we could pick him up. It seemed he was "wild" but not feral. He appeared to have been some ones cat at one time because of how quickly he tamed down. We figure someone dumped him as there are no nearby homes he would have come from. We are real creative in naming pets. The white rabbit was "Snow Ball". The fluffy cat "Fluffy" The gray billy goat, "Billy Gray". Guess what we named the black billy goat. So this black cat with white chest and four white paws became Tuxedo. Since he needed a full name, it is Tuxedo The Cat. Tuxedo was in good health when he adopted us. He was well built and well fed. He weighed 11 pounds. Before we "tamed" him down, we saw him catch and eat a lizard. He left bird feathers, squirrel parts and gopher parts around. He had been taking care of himself pretty well. We are firm believers in indoor only cats, so Tuxedo The Cat has become an indoor only cat. One day soon after we started keeping him indoors, he ran out the door, jumped up on the wood pile below the humming bird feeder and caught one my wife's little jewels, an Anna's Hummingbird. That day he almost went to the animal sheler (pound). Did you shake hands with Tuxedo. Go to SHAKE HANDS. This is Mac-n-Stuff's page on our cat, "Tuxedo The Cat"